1. In 1860, Ephraim Brenner began the hotel business, and though he was burned out of hotel and business in the great fire of that year, he has been identified with each ever since, building a large brick hotel in 1879. Socially, Mr. Brenner is a genial gentleman, and has a large and intimate circle of friends. 1. Faust operates a livery office with feed and stables at the rear of the Eagle Hotel and carries the mail and passengers to and from the Depot, Hotels, and residences and into the country. 1. Perry Cannon left livery business “at his barn” in 1916. 1. Ephraim Brenner is putting up an addition to his house to give him room to accommodate his increasing patronage and is well under way in 1877. 2. 1879 - The new Brenner House will be thrown open to the public Saturday evening and E. Brenner and wife cordially invite everyone to come and see them. Price of the supper is 50 cents. 1. Alfred Oatman mentor to his longtime Oatman Hardware employee Alvin Beck assisted him in starting his own hardware store in 1921. 2. Alfred Oatman retired in 1927. 1. William F. Beck joined his brother in the new firm, Beck Brothers Hardware in 1928. 1. William F. Beck purchased his brother's interest in the store in 1952 upon the retirement of his brother, Alvin L. Beck. 2. Enter the store any day and you would be greeted by Bill sitting in front of his huge, oak, roll-down desk. 3. William F. Beck sold the building to Macy O. Hallock for $35,000 in 1948. 4. In 1956, Bill Beck veteran Medina hardware merchant was presented a gold hammer by the Estwing Manufacturing Company of Rockford, Ill. The honor was bestowed in recognition of Beck’s fifty years of service in the hardware industry. 1. H. R. H. Grocery Store established in 1919. 1. Methodist church was founded Medina and organized by a Methodist circuit rider Rev John Hazarrd at Linas and Mary Thayer home in 1830. 1 The first Methodist church was built in 1839 where the Fred Renz and Nathan McClure lots were at the corner of Lafayette Road and South Court Street. 2. Mr. A. Champion gave the Methodists $3000 to build on the Montville end of Medina Village and that’s why it’s so far from town center in 1839. 3. S.G. Barnard taught a normal school in the Methodist chapel. 4. By 1840 there were 80 members of the Methodist church. 1. The congregation outgrew the 1839 church so the second Methodist church was built by W. E. Chidester for $2,000 in 1859 on Main Street on the town hill. They built a white framed church 20’ x 60’ with cushioned seats and clusters of kerosene ceiling lamps and a 23’ high tower after the style of the Presbyterian Church in Seville. S.G. Bunker established a singing school in the basement of the Methodist Church in 1859. 1. In 1872, there was a major renovation of the church where the old pulpit was replaced by new low plain stand, the pulpit platform lowered and hanging lamps were replaced with mirrored side lights, aisles carpeted, seat cushions added and the front steps and walk relayed with pine planks. 1. 1874 - "Elder Michael Shank, formerly pastor of the Baptist, church of this village and an evangelist of the old school, preached in the Methodist church Sunday evening. After he began to warm up to his work, he announced that he believed in being comfortable and pulled off his coat. It has been a long time since fashionable worshipers had the pleasure of hearing the gospel dispensed with by a man in his shirt sleeves." 1. On December 27, 1896 the old frame church was destroyed by fire and they received only $2,500 from insurance. 2. Construction was begun on a new church on April 2 1897 by Glanfield and Company of Detroit for $12,500, and the corner stone from the North Amherst quarry, cut by Frank Worden of Weymouth, was laid on May 20, 1897. 3. "On Sunday, Nov. 14, 1897 the new Methodist Episcopal Church was formally dedicated. Special music was rendered by the choir under the direction of A. M. Pulsifer at both morning and evening services. The morning sermon was preached by Rev. B. Ives, D.D. At the conclusion of the sermon a brief statement was made which showed that there was an indebtedness of $3,500.on the church. When the service closed, however the debt had been raised with a surplus of $1,000." The Methodist Church wooden steps were replaced with concrete steps in 1906. 1. There was no basement under the main part of the building until 1932, when the church basement was excavated by hand and shovel for a fellowship hall and kitchen. This excavation and the renovation of the entire church were accomplished at a cost of $11,000. 1. In 1945 and 1946 the interior of the church was again remodeled and redecorated at a cost of $11,000. 2. The Methodist Church bought a 20’ strip of land just south of the church property from Earle Gibbs, and then graded it for a driveway which will extend around the church and adding 15 parking spaces in 1945. 1. In 1956, 1959 and 1963 more complete renovations of the sanctuary, chapel and education building were completed under the direction of two different ministers at a cost of $170,000. 2. 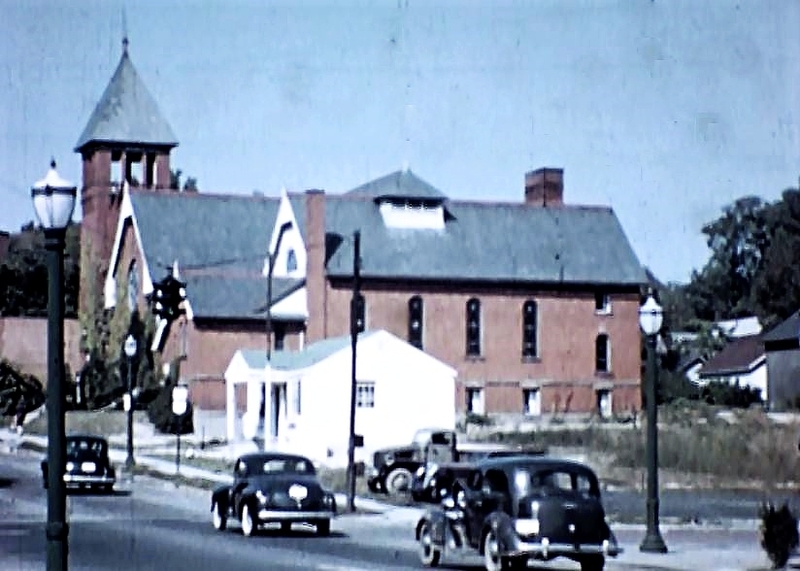 In 1959 the Methodist Church also acquired a rear lot on Broadway Street and the entire south lot at the corner of East Smith Road and South Court Street for additional church parking and 86 daily rental public parking spaces. 1. As a result of a substantial growth in the congregation that now numbers over 1200, the Church was remodeled and expanded west to the front walk in April 1967. 2. Since 1956 a total of $310,000 has been spent on church improvements with no indebtedness. 1. In 2014 the congregation of the Medina United Methodist Church moved to their new church located at 4747 Foote Road, Medina. 1. John A. Rettig, 18 years old, came to Medina in 1842 with his family, married Caroline in 1843 and founded Rettig Saddle, Harness and Trunks in 1844 at 233 South Court Street. 2. The John A. Rettig house was built in 1844 and was maintained as a family residence on the part-lot 42 until 1890 when the Rettig estate transferred it to son, Romeo R. Rettig. 1. Romeo and Richie Rettig residence from 1890 to 1924 when the property on part-lo4 42 was sold to R. O. McDowell and Clyde E. Jones. 1. Old landmark Rettig home on South Court was purchased by C. E Jones and Robert McDowell and will improve to make it a habitable rental in 1925. 2. Clyde E. Jones has a gorgeous dahlia garden, with some over 8’ tall in 1926. 2. In March, 1944 the Ella McDowell estate sold the part-lot 42 property at 270 South Court Street to Bonn Musch. 2. Bonn Musch had the Rettig house demolished by the same contractor that was demolishing the Union House Hotel in 1944. 3. Bonn Musch was unable to get Medina Village Council approval for his commercial project and in April, 1945, sold the property and part-lot 42 to Earle B. Gibbs, adjacent local automobile dealer. 4. Bonn Musch was successful in fulfilling his commercial project by building Medina Skateland Rink at Fenn Corners north of Medina in 1947. 1. The Methodist Church bought a 20’ strip of land just south of the church property on part-lot 42 from Earle Gibbs, and then graded it for a driveway which will extend around the church and adding 15 parking spaces in 1945. 2. 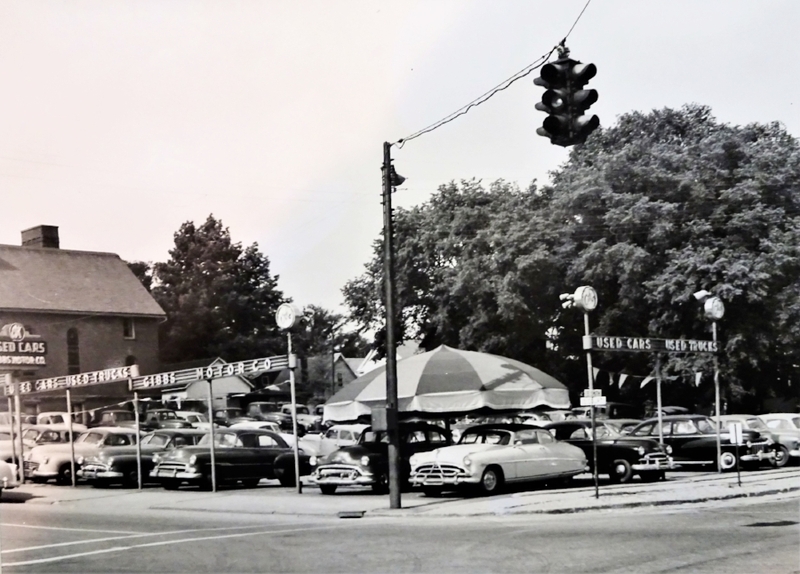 The Gibbs Used Car Lot combines a portion of part-lot 42 and full lot 43 purchased from owner of the Union House Hotel, Mrs. Nettie Johnson in 1943 and will have a used car lot there after the war. Dennis H. Shaw was the builder and proprietor of the Old Union House Hotel in 1856. 1. Mr. Peterson kept a tavern in the Old Union House. Old “Peet” Peterson ran the Union House and sold ‘hosses’ on the side. 2. In 1840, William Miller was a tailor in the hotel on the site of the Union House. He married Charley Waters’ daughter, a needlewoman who made many groom’s suits; he died in 1861. 3. Ben Water’s mom and grandfather made clothes in tailor shop in basement in1859. 4. Deacon Jesse Harrington, Temperance lecturer spoke here in1859. 1. Old “Peet” Peterson ran the Union House and sold ‘hosses’ on the side. 1. Dennis A. Shaw (noted violinist) bought and refurbished the Union House Hotel in1868. 2. Dennis Shaw bought the old church that stood where Judge McClure’s house is now and moved it to the rear of the Union House Hotel. He turned it into a dance hall for regular after supper entertainment of his patrons. 3. 1877-D. H. Shaw is getting his foundation stone from Weymouth Quarry and making the other preparations for building a new hotel on the site of the present house at the foot of Court Street hill. He proposes moving the wings of the present structure built in 1856 back out of the way, and occupying them as a dwelling while he erects the new building. The upright part of his present house will be elevated and otherwise remodeled, to fit the new part to be put up. It will be a good and needed improvement. 4. The Union House is a large and handsome structure at the corner of Smith Road and South Court Street and has 22 fine sleeping rooms. The parlor, dining room and office are pleasantly located on the ground floor. The dinner table is famous for the bill of fare and the House is conducted in a manner to insure the perfect comfort of all guests. The rates are only $1.00 a day, but the service and accommodations are equal to those of many higher priced houses. 5. Albert Curtiss has a new shop in Union House basement for harness work in 1880. 1. 1890 - "The Union House Hotel has recently passed under new management. N. E. Shaw, a well-known business man of Lodi, being at the head of the establishment." 1. Mr. Gish, the popular landlord, has had long experience in the hotel business, having conducted a house in Steubenville, Ohio and a restaurant in Cleveland prior to coming to Medina. After running the Union Hotel from 1891 to 1893, he conducted the American House in this city and he is widely known to the traveling public. 2. Mr. Gish is a native of Litchfield and previous to entering the hotel business; he had a livery stable and was engaged in jobbing and contracting. He is an amiable gentleman, courteous and obligating to all and he is much pleased at the efforts that are being made to promote the growth and importance of Medina. 1. Perry Cannon was a Civil War veteran and owned a 133 acre farm in Montville Township. 1. W. H. Zimmerman, well known as the ex-superintendent of the Medina County Infirmary, has leased the Union Hotel for a period of three years. 2. Perry Cannon left Union Housel in 1897 and Zimmerman transferred the lease to Mary Gish in 1898. 1. Traveling men and the people of Medina County who have occasion to visit the county seat have greeted with pleasure the return of Mr. A. A. Gish to the proprietorship of the Union Hotel, which he conducted so successfully from 1890 to 1893. Mr. Gish resumed the management of the House on September 1st last, and signalized the event by thoroughly and completely renovating, re modeling, refitting and refurnishing it with entirely up-to-date condition, and the success with which he is meeting in securing increased patronage is highly gratifying. 2. A fat jolly lady chef who knew many of her guests tastes in the early days and who liked to season foods generously, presided over the kitchen. Her cooking brought in capacity crowds of diners at 35 to 50 cents per head. 3. The room rate was $1 a single and $1.25 for a double room. The rooms had wall to wall carpeting, a wash stand and other conveniences. 4. The hotel had a livery stable annex where salesman covering the county, and other guests, could hire well-groomed houses and black shinny rigs at from $1.50 to $3.00, depending on the amount of time they were out. 1. Mahala Litchfield interest in hotel to sold to son Chas S Litchfield 42 $1600 in 1900. 2. Charles Sumner Litchfield came to Medina in 1901 and bought the Union House Hotel that his grandfather Dennis Shaw once owned and operated it until 1910. 3. Union House Hotel rooms were papered, new furniture added and a new awning placed across front in 1900. 1. W. H. Floyd rented the Union House to C.S. Litchfield in 1902. 1. Nelson was a harness maker and brother to former owner Dennis Shaw. 1. Charles S. Litchfield sold the Union House Hotel property to Albert R. Bixler for $1700 in 1910. 2. Albert R. Bixler bought the hotel furnishings from James Mohn. 1. H. M. Bixler sold the Union House Hotel to Harlan L. Kernan and B. O. Inman in 1917. 1. Inman and Kerman sold Union House to George Huffman of Weymouth in 1920. 2. L. J. Flickinger proprietor of Union House Hotel bought the Mohn Hotel aka Monitor Hotel on North Court Street in1924. 1. Mrs. Geo Huffman and 2 sons will manage the Union House Hotel while George remains on the farm. 1. Mrs. R. E. Nurse, divorced wife of George Huffman, owns the property and she will take possession. 2. Mrs. R. E. Nurse, proprietor of the Union House Hotel was arrested for selling illegal liquor in 1925. 1. Mr. and Mrs. A. M. Johnson renovated the Union Hotel and hired Chef V.J. Porpiglia in 1928. 1. Mrs. Nettie Johnson leased the Union House Hotel to F.W. Cook and E.A. Shafer of Akron, who will make improvements and will open it again. 1. Mrs. Johnson, the owner in 1943, bought it in 1924 and has operated or leased the Union House Hotel since then. 2. Nettie and Andrew M. Jackson, a loadmaster at AC&Y railroad, lived at the Union Hotel in 1941. 3. In 1938, Dining room service was given up. 4. In 1943, ill health caused Mrs. Nettie Johnson to close the Union House Hotel. 1. In 1943, Earl Gibbs bought the property from Mrs. Nettie Johnson and will have a used car lot there after the war. 2. It has been a hotel for about 80 years, originally owned by Dennis Shaw who added the east and south wings to his 1854 residence to make a hostelry. 3. The 25 rooms once did a flourishing business after WWI. As many as 30 people were turned away in a given night. 4. Under the contract with Earl Gibbs, A.R. Egner bought the building and has 2 years to remove it. 5. Egner plans to dismantle the building and build two houses on East Smith Road with the timber. 6. The Gibbs lot is 53’ x150’. 7. The Union Hotel is for rent by A.R. 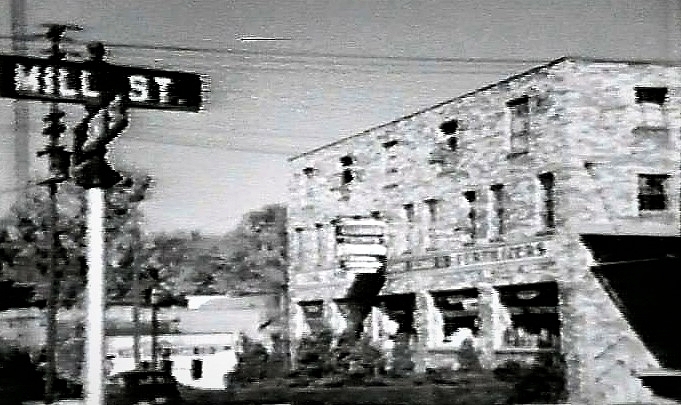 Egner, a furnished hotel style with a good location for a rooming house and restaurant in 1943. 8. On July 11, 1944, a public auction was held at the Union House Hotel. 9. A. R. Egner to auction all furnishings; 20 beds, cots, bath tubs, screen doors, iron sinks, good linoleum, 15 awnings, a baby grand piano that’s 100 years old, wash bowls, 12’ marble bar, an old chicken house and a 4 car garage, 16’ x 40’. 1. In 1959 the Medina United Methodist Church acquired a rear lot on Broadway Street and the entire south lot at the corner of East Smith Road and South Court Street for additional church parking and 86 daily rental public parking spaces. 1. Heintzleman leased the lot from the Medina United Methodist Church. 1. Century Ford leased the lot from the Medina United Methodist Church. 1. In 1880, R. C. Fenn was a farmer, in 1882 a liveryman and he retired in 1910. 1. Reuben C. Fenn sold his livery business to his nephew Charles M. Fenn in 1901. 1. Irena Huffman sold lot #50 and part of lot # 51 to S.J. Smith for $385 in 1869 and S. J. Smith sold the lots to R. C. Fenn for $850 in 1901. 2. Charlie rented out horse and buggy rigs and also kept a stylish Coach for funerals and to meet the old B. & O. Trains. 3. An important part of the livery stable business was boarding horses for town residents and visitors to Medina. The price was $3.00 a week for three feeds a day with hay on the side, and a fresh straw bed and daily currying. 4. Charles Fenn had 3 livery stables, one on North Court Street, one at American House Hotel and one at East Smith Road across from Union Hotel where he kept 12 horses and occasionally brought unbroken mustangs from western Ohio, tamed and trained them in a bull pen at rear of stable. 1. Reuben C. Fenn sold lot #50 to W. C. Arick in 1902 for $1400. 2. W. C. Arick barn addition on South Court Street is “L” shaped to the south and west and will extend to South Court Street where the entrance will be in 1903. 3. W.C. Arick sold livery barn on lot #32 to George E. Warren for $1500 in 1902. 4. Charles C. Robinson bought livery stock of W. Cliff Arick in 1906. 1. Occasionally the drummers hired spring wagons for hauling their sample wares of dry goods, hardware and gent furnishings. 1. Miller and Collin implement business, fence posts and sanitary closets moved to C.M. Fenn building vacated by C.C. Robinson, will remodel in 1912. 2. In 1915, Miller and Collin built platform in the angle of their warehouse that corner of East Smith and South Court and it covers a hole that has long been an eye sore. 3. Miller and Collin, bankrupt, dissolved in 1915. 1. E. F. Neumeyer sold corner lot # 50 to Edward C. Rolph in 1917. 1. Edward and Earle Gibbs bought lot 50 from Edward C. Rolph, raised the livery stables land and built a brick building for their auto sales and repair business at the corner of South Court Street and East Smith Road in 1919. 2. Edward Gibbs opened a dealership of Oakland and Chevrolet automobiles in the old Robinson livery stable in 1920. 3. 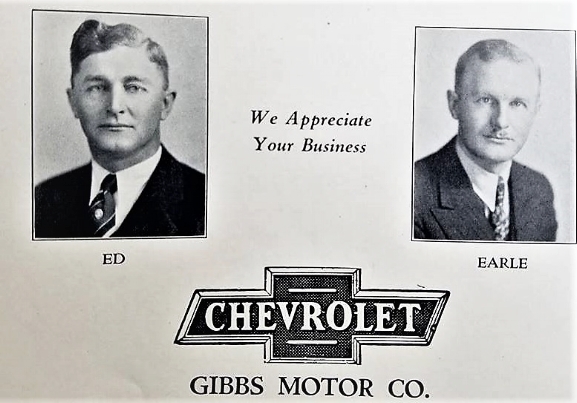 Edward C. Gibbs passed away in 1931 and Brother Earl Gibbs bought his partnership share in Gibbs Motor Company. 1. 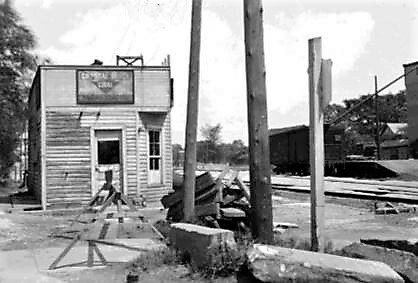 Charles Davis’s blacksmith shop building was sold to Gibbs Motor Company for a body shop and the lot adjacent on the east of the blacksmith shop building for $12,000 in 1938. The added frontage extending more than 100’ on East Smith Road in 1938. 2. Gibbs Motor Company enlarged their showrooms in 1923 and 1925 and added a large electric sign in 1929. 3. Gibbs Motor Company has eight salesmen in 1937. 4. Gibbs Motor Company added a concrete block building with a Quonset roof, 20’ x 36’, for truck lubricating and undercoating, just east of their showroom in 1946. 5. Norris Welton and Jerry Whittenberger, WWII veterans, operate a coin Laundry at Gibbs Motor Company in 1946. 1. Dealership moved to Pearl Road and Fenn Road in 1962. 2. Mrs. Persons had William Frazier move the 20” x 30’ barn in coal yard on W. D. Bowman property recently acquired in 1910, to 312 South Court Street. 3. In 1911, John W. Whitehead coal yard on Lafayette Road since1909, sold to O. A. Persons’s Medina Coal Company. 1. In 1915, Rolin and Bessie Hart purchased the Medina Coal Company from Orvis Person and Mr. Person will remain an employee. 2. Willard R Harley was employed at the R. E. Hart Medina Coal Company for 19 years. 1. In 1953 R. E. Hart sold Medina Coal Company to Paul Aikman 1947. 2. From 1949 thru 1954, Paul Aikman will sell coal, stokers, hay, grain, straw, and perform furnace cleaning. 1. In 1953, Paul Aikman sold Medina Coal Company to Calvin Carlisle, but will keep hay business and work out of Medina Coal Company office. 1. To provide greater facilities for the storage of coal, the Medina Farmers Exchange has leased from the A. C. & Y railroad, the former Medina Coal Company operated by the late R. E. Hart and more recently by Paul Aikman. 2. The Farmers Exchange will continue to operate the coal yard across the street between South Court and Elmwood Streets on the south side of the A. C. & Y. right of way. The award was for the building’s association with the history of agriculture and commerce in Medina. County. 1. In 1904, Durand Manufacturing and Stove Works Company sold Medina County Exchange lot 40 on South Elmwood Street for $700. 2. In 1904, Seth Swain sold his property at #320 South Court Street to Medina Farmers Exchange for $850. 3. In 1904, Seth Swain sold his property at #325 South Court Street to Medina Farmers Exchange for $1650. 4. In 1904, John Swain sold lot 53 just south of current building on east side for $850. 5. In 1904, H. S. Orr sold his lot 54 to Medina Farmers Exchange for $1650. 6. Medina Farmers Exchange building was moved from lot 40 on South Elmwood Street to #320-322 South Court Street by W.W. Felix of Montville Township for $450 in 1904. 7. M. E. Welton sold his farm implement business to Medina Farmers Exchange and they moved the stock to their warehouse at Northern Ohio Rail Road Depot in 1904. 8. Medina Farmers Exchange handsome wall under warehouse made of concrete stone made by Medina Concrete Company in 1904. 9. A freight elevator and grinding mill outfit added in 1904. 10. The Farmers Exchange was established in 1904 by S. J. Swain, E. Brenner, W. D. Wise, A. T. Spitzer, C. E. Hoover and F. W. Woods. 11. In 1905, Medina Farmers Exchange was incorporated and Seith Swain was elected President. 1. Mr. Rickard was born In Bucks County Pennsylvania, October 16, 1848, the son of Daniel Rickard, and a member of one of the substantial Mennonite families of that county. The family came to Montvllle Township early in 1849 settling on a farm just east of Poe, which was the home of the father, until his death and was the boyhood home of I. H. Rickard. 2. He married Catherine Kennedy December 30. 1875, taking his bride to big new home in Chippewa Lake, where he was active for years, operating the Brick and Tile Works at the time of his election to the county treasurer-ship in 1902. With his election, he moved his family to Medina and since had made his homin Medina village, establishing business connections after his two terms in the treasurer's office and bringing his wide friendship throughout the county to his work as President of the Medina Farmers Exchange. 3. In 1907, Isaac H. Rickard was elected President of Medina Farmers Exchange. 4. In 1915, the following were officers of the Company: President, Isaac Rickard; Vice President, H. S. Koppes; Secretary-Treasurer; C. E. Hoover, legal advisor; Frank Woods; Directors, A. T. Spitzer; I. H. Rickard; Fred Snyder; H. S. Koppes; D. H. Rickard and C. E. Hoover. 5. In 1915, a fire totally destroyed the Medina Farmers Exchange. The fire was first noticed by Mrs. Fred Snyder wife of one of the proprietors, as she sat at her office desk. 6. In 1916, construction was begun on new buildings just a little south of those destroyed. The accompanying picture fairly well represents the new plant of the Medina Farmers' Exchange Company, located on South Court Street, on a lot with a hundred foot frontage and extending east to South Broadway, which is now being operated in full by the company. The new building is 120 feet by 40 feet and including the basement, has four floors with nearly 20,000 feet of floor apace. It is built about 30 feet south of the location of the old build south of the location of the old building destroyed by fire on Dec. 17, 1915, entailing an estimated loss, of from $20,000 to $25,000. Work on the new building began early in the spring and with its completion Medina has one of the most modern and one of the best equipped buildings of its kind to be found in this section of Ohio. The building is of wood structure upon a concrete base, the basement proper being of concrete as are also the six immense grain bins, each five feet by eight feet, inside measurement, and 38 feet in height and each having a capacity of 1.200 bushels. The engine room, in which there are installed two 50-horsepower gas engines, is also of solid concrete and is 24 feet by 30 feet. The amount of concrete work in the basement, walls, grain bins and engine room is in round numbers 375 cubic yards, in which there were used 500 barrels of cement. The weight of the concrete is about 600 tons. The plant presents many interesting features aside from the powerful engines, the immense grain bins, etc. For instance, there is the new Sprout-Waldron feed grinder with a capacity of four tons per hour; the great grain elevating device with a capacity of 1,500 bushels per hour both in taking in grain or in loading it from the bins to the car. The elevator from the basement to the third floor used to elevate anything from a sack of flour to the heaviest piece of machinery; the flour room with storage for several carloads of flour, and a water system of fire protection extending to all floors of the building. On the south side and extending the full length of the building is a shed 20 feet wide for the accommodation of those loading or unloading. There are also a number of sheds for teams south and east of the main building. Another department is a large room on the second floor devoted exclusively to a full line of repairs for all kinds of implements handled by the company. The office of the company which is located on the first floor and facing South Court Street is well appointed throughout, with conveniences for the accommodation of patrons. The office as well as the entire plant is Electrically lighted. 9. A 40’ x 120’ 3 story building with a cement basement, south of the old elevator with wood in main building, but cement grain bins for a total cost of $15,000-$18,000 in 1916. 10. The house that stood at least since 1846 on west side Medina Farmers Exchange lot was moved to east end of the lot for new elevator in 1916. The building may be remodeled and used as additional storage. 11. In 1922, Clement Concrete Company built a 110’ x 60’ garage for Medina Farmers Exchange. 1. Albert Snyder came with the Medina Farmers Exchange in 1908 and succeeded to the presidency in 1927. 3. Albert and Fred Snyder own and control the majority of the stock of the Medina Farmers Exchange. 4. A 1935 grand reopening was a huge event for the city with thousands of people in attendance. Two orchestras played during the event and there were more than 100 floral arrangements on display. There were roses for the women, cigars for the men and balloons for the children, according to a story published in The Gazette. 1. 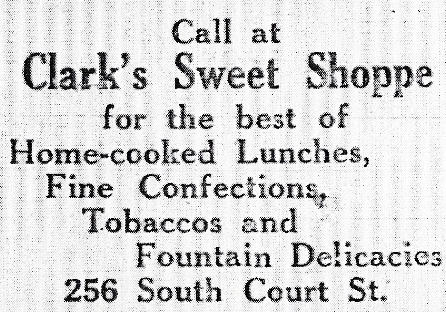 In 1931, R. D. Whitmore opened a food service and lunchroom on the north corner in the basement at Medina Farmers Exchange. 2. Medina Farmers Exchange sells Christmas trees in most popular sizes for 85 cents - $2 with free planting instructions in 1933. 3. In 1935, a fire again destroyed the Medina Farmers Exchange main building, a 3 story wood and brick warehouse and retail store. $75,000 damage was insured and they will rebuild immediately in 1935. Medina suffered one of its severest fire losses when the three-story main building of the Medina Farmers Exchange Company burned to the ground, Thursday morning. The fire was first discovered by Officer Allen Hange. When he was making his rounds about 2:30 a. m, he saw a glow in the sky over the tops of the buildings on the south-side of the square, went far enough down South Court Street to identify the Farmers Exchange as the burning building and dashed back to the Engine House to turn in the alarm for the Fireman. The fire department responded immediately to the alarm and both units were on the job and throwing water in a few minutes. The fire spread rapidly through the upper floors, however, and before any effective headway could be made the building was a mass of flames. Mill Dust like Gasoline. 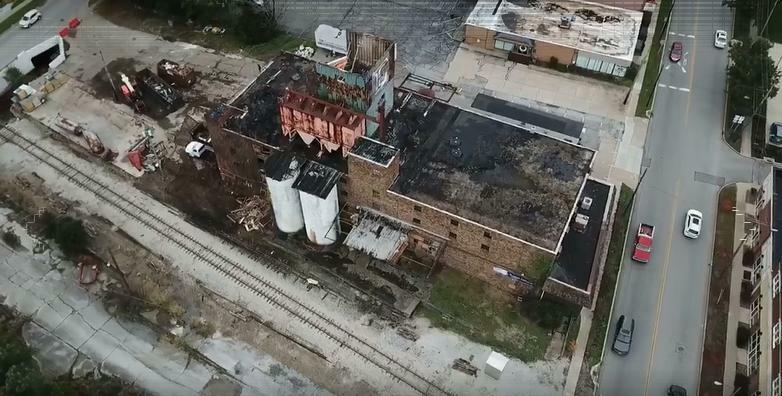 The fine particles of grain and mill dust, according to Fire Chief Emmanuel Tinstman, not only carry fire with the facility of burning oil, but they spread it rapidly by a series of explosions. This characteristic of the dust undoubtedly accounts for the rapid spread of the fire. The firemen were able to save some of the stock in the new brick ware house, mostly paint and seeds, and also to carry out the safe and some valuable papers from the office which was in the wooden part of the structure, but beyond that, everything burned. The firemen kept five streams of water playing on the conflagration and prevented the fire from spreading to the brick power house, which stands just back of the main warehouse toward Broadway, scarcely 30 feet from the main building, and containing two valuable Diesel engines. Several wooden sheds, within almost as close proximity to the structure, were likewise saved, as well as the warehouse across the street. The interior of the building at the time was a glowing mass of burning coals, with little tongues of flames shooting out giving evidence of the tremendous heat which was gradual consuming the mass. Fire Chief Tinstman estimated that it would be a matter of days before this fire had completely burned itself out. Albert and Fred Snyder, Presides and General Manager were among the first on the job and directed the saving of what little was salvaged. They also worked to get inflammable object close to the fire out of the way so that the blaze would not spread. Neither could give any reason to what caused the fire or an estimate of what fire loss may be. They state that their night watchman. E. E. Holtzburg had made his final round of inspection at midnight and reported no sign of fire at that time. Fred Snyder was working in the office until after 9 o'clock in the evening, and everything was all right then. Serious as the fire is it is no new experience to the Snyder boys, since both were with the company in 1915 when it suffered a similar loss. A bigger and better company rose out of the ruins of that fire and the boys are already planning on rebuilding again a better and finer building will rise from the ruins. The company is one of the oldest in Medina. Last year it celebrated 30 years of service to the community, having been founded in 1904. One the original founder, C. E. Hoover, secretary of the company, still remains in active service. Albert Snyder, president of the company, announced that the company was adequately covered with insurance and that the estimated loss would be somewhere around $75,000, but the actual figure could not be determined. The work of rebuilding was started Thursday, while the embers of the fire were still glowing. 6. A new garage 110’ x 60’, a one story building on the west side of South Court Street at 321 was built by the Clement Concrete Company at the Medina Farmers Exchange Co. for Fred and Albert Snyder who are majority owners in 1935. 1. In 1937, a fire gutted the 3 story wooden building on the west side directly opposite the offices of Medina Farmers Exchange built by Sim Oatman in 1903 for a grist mill, later sold to Frank Wood Company, then to Seth Swain, then to Albert and Fred Snyder for the formation of Medina Farmers Exchange. 3. In 1939, Medina Farmers Exchange purchased the harness shop of Catherine and Charles Wolf on town hill and will conduct the business from their warehouse on South Court. Street. Mr. Wolf, a harness maker for 57 years, retired. 1. Where else but at a filling station of this type, a farm elevator, would a spring wagon powered by a four footed one horsepower motor stop and refuel? 2. Here is Albert Snyder, president of the Medina Farmer Exchange Co., providing a Vermont critter with sustaining Medina county oats to speed the traveler Mrs. Olgie Lamear on her long trek to Arkansas. 3. Recollections of the "Arkansas Traveler" were brought to mind last week when Mrs. Olgie Lamear, without human companionship, passed through Medina in-route from Castleton, Vt., to Ozone, Ark. 4. While Mrs. Lamear was without a companion, she was far from alone. Piled on the one-horse spring wagon she was driving were four goats, a yearling goat, two kids, a small flock of chickens, tools, lanterns, a bale of hay, straw and. of course, a few gallons of Vermont maple syrup. 5. For protection, Mrs. Lamear had beside her a loaded .22 caliber rifle, but she said she didn't need it as folks along the way had been most kind to her. 6. She left her Vermont home July 7 and expected to reach Arkansas in October. 7. She stayed over-night at Strongsville and remarked that the Strongsville police helped push her wagon up Stony Hill. 8. The next night she spent at the Medina county fairgrounds after securing feed for her seven-year old mare at the Medina Farmers' Exchange where the boys loaded her up with fodder. 9. Leaving Medina on route 42, Miss. Lamear, who admitted that she, was in her early sixties." said she expected to follow route 42 to Columbus and then head in a westerly direction. 2. Mr. Lucas worked his way up from a truck driver post to President and then took over the top job when Albert Snyder died in 1961. 1. Maynard E. Letterly was born in Medina in September, 1919 and graduated from Medina High School. 2. Maynard E. Letterly was a 39 year employee of Farmers Exchange and served as President upon the death of Hugh Lucas in 1973 to 2007. 3. Maynard served as a Marine in the Pacific Theater at Guadalcanal during World War II from 1941 to 1945. 4. Mr. Letterly was civic minded and served on the Board of Directors of The Old Phoenix/First Merit Bank and the Medina General Hospital. He was a member of the Medina City Police Auxiliary and the Honor Guard of the American Legion Post 202. 1. Mr. Duffy operates a Farmers Exchange operation at two additional locations at Norton and Berea, Ohio. 2. In 2016 was building at 322 South Court Street condemned by the City of Medina and Mr. Duffy was forced to close and move there operations to their other Medina Warehouse at Exchange Park Drive off West Smith Road. 3. The buildings are for sale and are listed with Gerspacher Real Estate Group for $695,000. 4. While it remains closed, Medina Mayor Dennis Hanwell said the city has had three individual developers look at the building for potential redevelopment and reuse. 5. In 2017, the Medina Farmers Exchange Company was nominated by historic preservation consultants Diana Wellman and Wendy Naylor, of Naylor Wellman LLC., in Chagrin Falls, for the building's association with the history of agriculture and commerce in Medina County. 6. The building was listed on the National Register of Historic Places in February, 2018. It was designated a local landmark by the Medina Landmarks Commission in 2012. 1. The historic Medina Farmers Exchange Co., 320 S. Court St., was sold Aug. 28, 2018 for $250,000, according to the Medina County Auditor’s Office. The building has been vacant since September 2016. 2. The development group Beacon Farmers Exchange LLC, headed by Charles Marshall, wants to renovate the structure, turning it into 33 residential units, a 128-seat restaurant and a 3,780-square-foot retail market on the first floor. 3. There will be extensive work performed on the exterior of the primary building as part of the rehabilitation. A large accessory building on the east side of the site will be demolished and the area will become on-site parking. 4. The entire structure is about 50,000 square feet and has four levels, including a basement. 5. The existing structure contains the original metal capping along the roof parapet line. The majority of the original metal framed windows have been preserved. The structural metal overhangs at the north and south facades are present but in poor condition. The elevated deck is original to the structure, predating the 1935 rebuilding after the fire. The original brick remains unaltered and unpainted since 1935, and several historic signs are present in the building. The structural canopies, grain silos, and metalwork from the 1930s mill operations are intact. 6. The redevelopment of the historic Farmers Exchange in Medina is under way as Beacon Marshall continues construction on the property. 7. The original plans for the building have changed, as Marshall said the lower level of the building which he calls the garden level will now be built for commercial, rather than residential use. 8. Keller Meats will come to Medina and open up a butcher shop on the first floor, along with an indoor market. A meat-themed restaurant is slated for the first floor, as well. 9. Marshall said tenants for the garden level below have yet to be determined, but that he would like to lease it to mercantile shops that would play off the other tenants, as well as the historical nature of the building. 10. The second and third levels of the Farmers Exchange are still slated for residential use. With each floor being about 10,000 square feet, Marshall plans to put nine units on each level. Each apartment will show off the industrial feel of the building Marshall said, with exposed concrete ceilings, as well as concrete floors in parts of the apartments. 11. 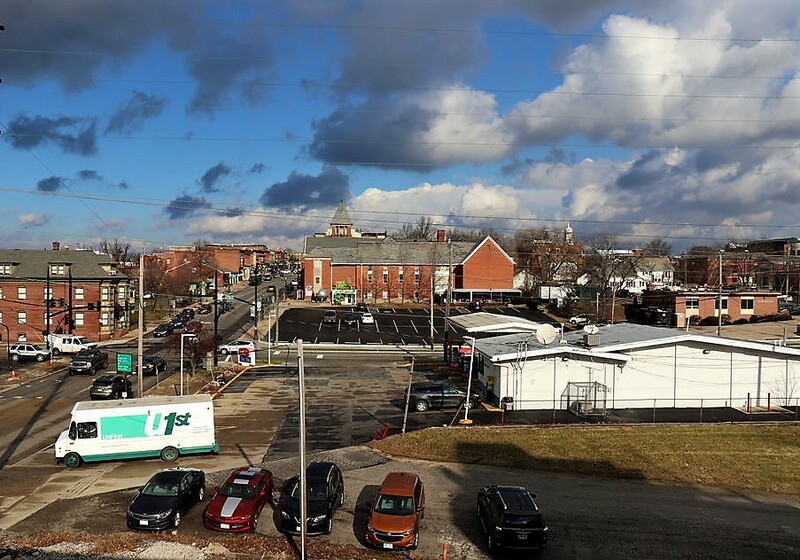 Marshall's redevelopment of the building is being aided by Ohio Historic Preservation Tax Credits, which can contribute up to $545,000 of the project cost. To get the credits, changes he makes to the building will have to be approved by the state. This view from the third floor reminds residents that the square is only a short walk away.